With a VPS or dedicated server, you can set up separate web hosted user accounts, each with its own domain. 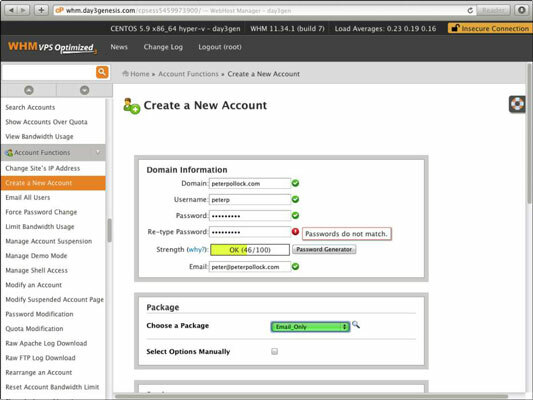 If you are the only one using the server, this may not be necessary, but if you are sharing the server with friends or family, then it can be useful to set up separate accounts for each person so each has his own cPanel login and can manage accounts. Scroll to the Account Information section and click Create a New Account. Enter the primary domain name and an account user ID. Each new account requires a primary domain name and an account user ID. You can give it any ID you wish, but in WHM you are limited to eight characters for the ID. It is easier if you select an ID that has some relevance to the person using it, such as her name or the first eight characters of the domain name. Create a password for the user and enter his e-mail address. Click OK. Select the hosting package this account will be under and make any necessary changes to the Reseller, DNS, and Mail Routing settings. It is not normally necessary to make changes to the Reseller, DNS, and Mail Routing settings. You have now set up the user account and given it a hosting package. The nameservers for the domain must point to the server you are on for this hosting package to become live. If they do, you can now go to cPanel.thedomainname.com and you will be able to log in with the username and password you just set up.